The government has declared an incentive package to encourage non-cash payments for fuel, new insurance policies from public sector firms, train tickets and highway toll, among other things. For credit and debit card transactions up to Rs.2,000, the Reserve Bank of India has relaxed its stringent(कठोर) two-factor authentication requirement, and service tax stands waived(माफ कर दी). Taken together, these moves to encourage cashless payments are significant not just because they can alleviate(कम करना) the cash crunch(की कमी) following the demonetisation of high-value notes. They could spur(प्रेरणा) a change in spending habits in an economy where cash has served as the basis of around 95 per cent of all transactions. From those between traders and farmers to settling a restaurant bill, the use of cash creates a window to escape the tax net. Shopkeepers routinely ask buyers if they would like a bill or not, and those who opt for the latter to save some rupees are often left with little recourse if the goods prove to be substandard. By contrast, cashless payments can be captured electronically through the settlement mechanisms, bringing more revenue to the government and ensuring consumer rights. 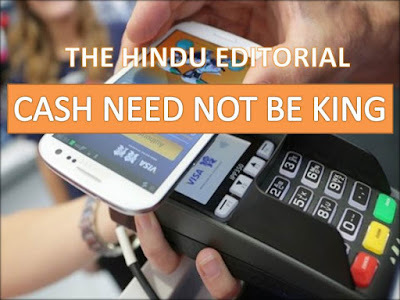 Given India’s abysmal(निराशाजनक) tax base, this nudge(टहोका) to cashless payments could be a game-changer, with the introduction of the Goods and Services Tax. A nudge to move people away from cash, especially in the rural economy, first came in Yashwant Sinha’s 1998-99 Budget, with the issue of Kisan credit cards to farmers. Around 15 years later, RuPay cards were introduced with an eye on lowering payments to service providers such as Visa or Mastercard. By November this year, 29 crore such cards had been issued, 19 crore of them linked to Jan Dhan accounts. The Narendra Modi Cabinet approved a two-year action plan to encourage digital and card payments this February. If some of the proposed measures, such as rationalising the merchant discount rate on card transactions, had been implemented before the demonetisation announcement, perhaps the current pain due to a tight supply of cash could have been ameliorated(सुधारना) somewhat. With new payments banks coming up, along with mobile wallets and banking applications, India’s transaction ecosystem could see a paradigm(मिसाल) shift provided the government puts in place effective monitoring systems and ensures interoperability(अंर्तकार्यकारी) between these alternatives. An estimated Rs.18,000 crore is spent to maintain ATMs, and if even a quarter of ATM withdrawals are cut by the switch to cashless payments, banks could use the savings to reach the unbanked millions and still lower digital transaction. 1)Stringent meaning is rigid. tight,harsh. 2)Waived meaning is give up, let go, grant. 3)Crunch meaning is crucial point, difficult, crisis. 4)Spur meaning is incitement, stimulus. 6)Nudge meaning is bump, elbow,push.